CISF Recruitment 2019 - Apply Online for 429 Head Constable Posts in CISF, Across India on a Temporary Basis. Online Applications are invited by Central Industrial Security Force from 21 Jan 2019 to 20 Feb 2019 til 05:00 PM (Extended till 25 Feb 2019 05:00 PM) for 429 vacancies. Pay the Examination Fee Through SBI Challan, Debit Card, Credit Card, Net Banking or Pay Offline Through E Challan. Corresponding to height and age as per medical standards (for males and females). Weight will be recorded at the time of physical measurements but the decision on fitness on account of weight will be taken at the time of medical examination. On the basis of Written Examination, PET and Medical Examination. 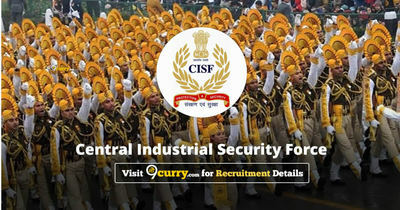 Candidates log on to http://www.cisf.gov.in/. CISF Recruitment 2019 - Job notification for Assistant Financial Adviser (AFA) Post in CISF, Delhi on Deputation Basis. Applications are invited by Central Industrial Security Force on or before 05 Jun 2019 for 1 vacancy. CISF Recruitment 2019 - Job notification for Assistant Financial Adviser(AFA) Post in CISF, Delhi on Deputation Basis. Applications are invited by Central Industrial Security Force on or before 11 May 2019 for 1 vacancy.